Everyone knows that coupons are available in Sunday papers. Today I spoke with someone who was unclear about other ways to get coupons. I want everyone to know the different sources of coupons that are and readily available. Below are three great sites that are FREE to everyone. The coupons can vary on what region you live in. You are allowed two copies of each coupons, simply click your back space key during the printing process. Limits are placed on how many total coupons can be printed, so always print your copies when you see an update. Coupons are updated weekly so be sure to check back often to see what changes have been made. You may have seen me list coupons from ALL YOU magazine. ALL YOU can only be purchased at Walmart, however, you can subscribe. Right now I am able to offer you a one year subscription for only $16.50. 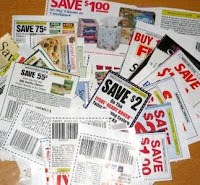 Each issue contains an average of $75 in high valued coupons. While this magazine can only be purchased at Walmart, these are mfg coupons and can be used any where that accepts coupons. Cell Fire is a new form of couponing. It is also FREE to use. If your store offers a loyalty card, you are able to download coupons directly onto your card. This is great and simple, there are no coupons to print. You only need to hand your card to the cashier and they are taken off automatically. To stay current you will need to download coupons from time to time. Coupon Clippers is a great place to purchase more than one copy of the same coupon. You pay a small handing fee and shipping and select the exact coupon you want. This is great if you are lucky enough to know that a sale is coming up. You can expect about a 4 day turn around, timing the sale is key. Don't miss and deals, Subscribe Now! Love that magazine- great recipes too!